If you’re thinking of installing a flat roof it’s important to make sure you are up-to-date with all the rules and regulations before you begin with a new flat roof construction. Flat roofs are an often lower cost and easier to install alternative to traditional pitched roofs. They are common on extensions, garages and commercial buildings. As opposed to old built up felt roofing with joins, new single-ply waterproof membranes are now most commonly used. As the Single Ply Roofing Association (SPRA) points out, this type of flat roofing is strong, durable, completely sealed and usually lasts at least 25-30 years. There are two types of flat roof; cold roofs and warm roofs. Cold roofs have the waterproof layer placed directly onto the roof deck and the insulation inside the roof, just above the ceiling. In this case ventilation is required and the roof can still become wet with condensation which may cause materials to decay. Warm roofs are recommended for homes; the insulation is applied above the roof deck with waterproofing on top which eliminates the need for ventilation and keeps the roof warm. Sometimes the excitement of starting a new construction project or building venture can lead you to forget about the finer details such as planning permission and local building regulations. These things will affect the timing, cost and overall running of your project. So whether your new flat roof is to be made of timber, concrete or felt, or a combination of these materials, you need to comply with flat roof building regulations. 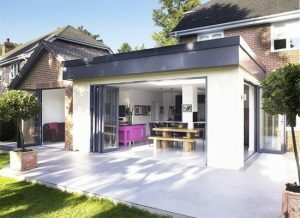 When do I need planning permission for a flat roof? You are making any structural changes to the roof. If the new roof covering is going to be different than the old one and this will affect the roof in the event of a fire. If you are replacing more than 25% of the roofing area, then you will also need to replace the thermal insulation. Depending on where you live in the UK, snowfall must also sometimes be considered in determining the gradient of the fall. 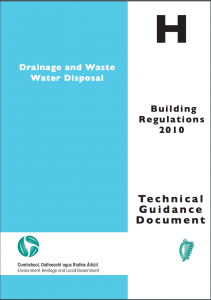 Drainpipes and guttering: Under Part H of the Building Regulations, drainpipes and corresponding guttering must also be fitted on at least two sides of the flat roof to ensure the flowing water doesn’t accumulate at the base of yours and neighbouring buildings. Joists and noggins: Flat roofs on houses must be designed and built to be strong, durable and wind resistant; the size of your joists and noggins and preliminary timber layer will be determined by the weight of your flat roof. Materials: You need to make sure that the roofing materials that you choose are the correct size so that the roof can support an average man’s weight. thermoplastic or elastomeric are the most effective and should extend up adjacent walls at least 150mm from the roof surface. Roofing Insulation: A thermal layer of fibreglass, polystyrene or other insulating material should be inserted either above the roof decking (the ‘warm-roof’ model), which is suitable for homes or permanent residences; or else on the interior of the building just above the ceiling (a ‘cold-roof’), which is cheaper, but less effective. Vapour Control Layer: All warm flat roofs must also have a VCL (Vapour Control Layer) inserted between the top decking and the first layer of insulation; this can be made of polyethylene membrane, bitumen sheet, polymeric foil or even be a cheap, easy-to-apply self adhesive sheet. Open Building Notice: Finally, you will need to contact your Local Authority to issue firstly an Open Building Notice, that allows you to get started with your roofing project; and secondly a Certificate of Compliance on completion of the project, to prove to potential buyers that your flat roof meets all construction and energy efficiency guidelines. Remember, although it is important to factor in all these regulations when planning and installing your flat roof, what is listed here is only a rough outline or summary. If you are unsure about anything or want to double check certain issues, then you should apply for a copy of Building Regulations: Work on Existing Buildings (Structure) Part L1B, which carefully describes all of these rules in significant detail. If you hire a professional roofing contractor/company instead of attempting a DIY job, they will also be able to advise and consult on a number of these issues. It may sound like a lot of hassle, but by sticking to the rules you will prevent any construction problems or hefty fines further down the line – so taking the time to plan properly will definitely prove worthwhile. What Insulation to Choose for Flat Roof or Pitched Roof?